"No rules, no refs, and the chance to be remembered for a lifetime…" RLJ Entertainment has debuted the first official trailer for the new remake of the original 1989 Kickboxer action classic, this one retitled to Kickboxer: Vengeance. Believe it or not, they actually got Jean-Claude Van Damme to come back (as a trainer), and the rest of the cast isn't so bad either. Canadian stuntman Alain Moussi plays the new young kickboxing hot shot, and he goes to battle against Dave Bautista as a guy named Tong Po. The cast also includes Gina Carano, Georges St-Pierre, Cain Velasquez, Fabricio Werdum, Matthew Ziff and Darren Shahlavi, among others. I don't have that many good things to say about this, as it's probably better to just watch the original Kickboxer instead, but maybe some people will be entertained. Have fun. Eric and Kurt Sloan are the descendants of a well-known Venice, California-based family of martial artists. Kurt has always been in older brother, Eric's shadow, as he lacks the instincts needed to become a champion. Against Kurt's concerns, Eric accepts a paid offer and travels to Thailand to challenge the Muay Thai champion Tong Po and fails with dire consequences. Kurt sets out for revenge. He trains with his brother's mentor, Durand, for a Muay Thai fight against the merciless champion, Tong Po. Durand first thinks Kurt is impossible to train, but through a series of spiritual exercises and tests, Durand discovers that Kurt has a deeper strength that will carry him through his final showdown with Tong Po. 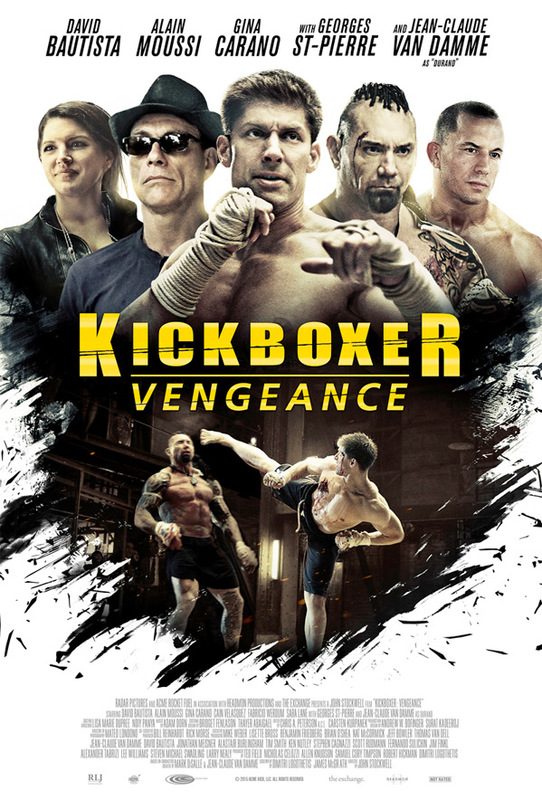 Kickboxer: Vengeance is directed by American filmmaker John Stockwell, of Cat Run, Blue Crush, Into the Blue, Dark Tide previously. The film arrives in select theaters starting on September 2nd this fall. So? Flashbacks to Nam with this one. Did you see it by now? I did and it was terrible. Oh my, this looks horrible. I love the original and seeing this trailer I think it holds up pretty well and still will be superior. Something's wrong about this since J-C Van Damme still looks to be the best in it. Darren Shahlavi's last movie ... RIP It is really disrespectful that his name is not on the poster ..
Uuuugggghhhh! Another remake for absolutely no reason. What a surprise. And I'm sorry Bautista, I like you, but you ain't no Tong Po. You were so right. He was a very terrible Tong Po. Haha! I see this is on netflix now, but I still won't watch it. I would only watch this after 3 whiskeys. I call that "Saturday." Do you mean three shots or bottles? Because three shots won't be enough. But will it have a dance scene? Not in the movie itself but in the credits scene directly after the film ends. And yes it was glorious. Somehow they managed to make a remake even whiter than the original that came out 27 years earlier. Johnny Cage v Goro... FIGHT! This will be a guilty pleasure for me. I loved the original when I was younger and just have to see how this one plays out. It's like a fan made film where they managed to let JCVD do a glorified cameo. It's appalling how awful he was in this. He did not take the film seriously at all. Since he is of age he could have been brilliant as the sensei. But no, JCVD wants to do Shakespeare. These movies are beneath him now. " To beee oorrrr not tooo bie thatsss tze question? " (My imitation of him doing Hamlet). After all these years he still has not managed to diminish his accent somewhat. They always need to go out of their way to explain where the accent is coming from. Alain Moussi (main character) also is from a French speaking nation but he barely has an accent. Just saying. Dat a-hole boxer from IP MAN 2 got ICED. Mehmehmehmeh. Many months ago I remarked that this trailer looked horrible. Despite I gave this film a chance and boy did it let me down. This film was horrendous. The idea is to defeat people with skill and finesse without hurting the opponent that much. If it were only brutality fights would be very boring.